I've been using HubSpot's new Signals app for a few months now and I have to say I really dig it. For the uninitiated, Signals is an app you can use with Gmail or Outlook that tells you when someone opens emails you've sent them or clicks links within those emails. You can also connect Signals to Salesforce and HubSpot for more robust tracking capabilities. Timeliness - If a customer or lead I am really interested in speaking with has just opened an email from me (because Signals notifies me), I might take that opportunity to give that person a call. After all, I'm top of mind for that person and they (hopefully) will appreciate my diligence in following up with them. "Just calling to follow up in the email I sent..." is a really easy way to start a conversation especially when someone has just opened that email. Frequency - Signals also tells you the number of times a person views your email. I recently sent an email that focused on clarification of a topic that was viewed over 50 times over a period of a few weeks. It was a detailed and lengthy email and naturally the topic of the email was addressed in my subsequent conversations with that lead. If a lead or prospect is viewing an email over and over you should either assume that it's important to them or confusing them. This simple and straightforward data is powerful to have since email exchanges are so critical to business communication today. Link Clicks - Many times when working to close a deal or even just to provide more information to a potential client, I will send links to previous projects or to sections of our own inbound website as reference. 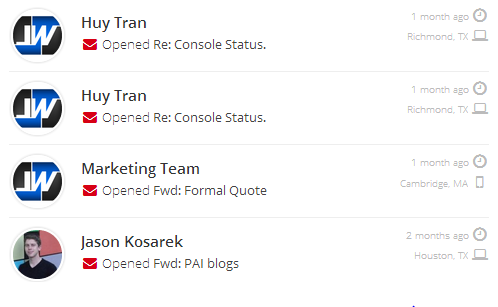 Signals lets me know what links the email recipient clicks. If I send three links and they click on my link to a results case study that tells me I may want to talk to them about how we develop goals and results with clients. If no links are clicked I may be prompted to ask if they've had a chance to review the links I sent before scheduling a follow up call. Location - Signals also lets you know the geographic location your emails are viewed from. When you are working across time zones like we do, this is very useful information. When your California lead opens your email at 5am PST - that's a good sign - but an email followup rather than a phone followup might be advisable at that time! As a new app - Signals is certainly evolving. The free version of Signals offers 200 free email and click notifications while the paid version ($10 monthly per user) offers unlimited email open and click notifications per month. It would be nice to see a Signals smartphone app. To have the ability to receive an email when someones opens your email so I don't have to go to my Signals stream or have my Chrome browser open to access Signals data. I have noticed that I occasionally received a Signals notification when I open the original email I sent within a thread. Being a novice techie at best, I'm not sure if there is any good way for Signals to control for sending data on anyone other than the intended recipient opening an email. Overall, I enjoy the powerful simplicity Signals offers right in my browser and without the need to login HubSpot, Salesforce or even open an Outlook client. Have you used Signals? I'd be interested to get your take on this new inbound marketing tool.